Home regular Is Flipkart really serious about customer feedback? Is Flipkart really serious about customer feedback? To my luck, the price fell from 5200 bucks to 4949 as shown above. Promptly enough I received the delivery of this printer in two days. I setup the printer and took a test print out via WiFi connection using my iMac. The next step was to setup the scanner functionality by installing additional drivers from HP on my mac. While I was doing this, the printer switched off. Given this criteria of handling things which is best suited to them, it also shows how tight a control they have over dealers and distributors of some items such as this (electronics). Just to speeden up things I myself called them each time the ticket did not progress. Then I had a troubleshooting document given by HP sent to me by Flipkart which also I tried without any use. Now comes the returns/refund part. This is where Flipkart annoyed me. They asked me to take the product to a service center and check, which I promptly disagreed with. The very reason I do online purchases is not to waste time going physically from one place to another just to service something that came to me almost dead. Thankfully flipkart offerred me all three choice and no guesses which one I chose for reasons of convenience and not to go through this process again. Option 3. Their turnaround time for this was 7-10 business days but I chose to wait. Somehow a refund was processed in just 2-3 days. What is the end result of all this? I ended up having to spend 10 days buying a product that never satisfied me. The learning I had with this experience was simple : Never buy those products online that are readily available next door. Its better you can choose to go to a service center yourself rather than having to wait for flipkart to suggest you to do so losing 10 days in the total process. Of course their gesture of refund was highly appreciated, but their turnaround time was a sore point in the whole deal. Given their sales volumes I can understand all this delay, but in my perspective I am a single customer wanting to strike a deal and this delay is perhaps too huge. Obviously the last thing I had to do was to put up a review on their website about the service rather than the product which I did promptly. And after few days, Flipkart removed my review citing flimsy reasons. 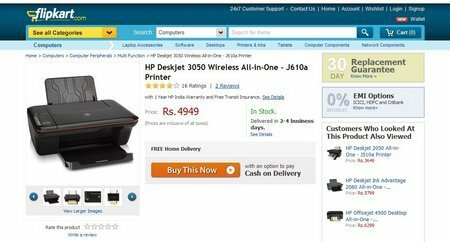 Thank you for your feedback regarding the issue you are faced for “HP Deskjet 3050 Wireless All-in-One - J610a Printer”, dated 10th January 2012. Your feedback is valuable and of utmost importance to us, we understand that we were not able to meet your expectations and apologize for the same. Feedback has been shared with the concerned department ensuring you will not face the same in future. We would shortly roll-out a customer centric forum welcoming your experiences and feedback on our services and products. We appreciate your patience in this regard. As per our review policy (www.Flipkart.com/s/help), we solicit only product specific reviews and hence your review on our service has been removed. Please feel free to share your concerns or queries with us at cs@Flipkart.com. The very fact they solicit only product based review is acceptable to me, but given the company wants to be a leader in the space they operate in, they must not have the slightest hesitation to publish even critical comments like what people in Amazon do. I am sure even Amazon will have some filtering. But to say they have removed my review which is not abusive either but speaks of their turnaround time is obviously for their benefit. Everybody has some loopholes in the way the operate. 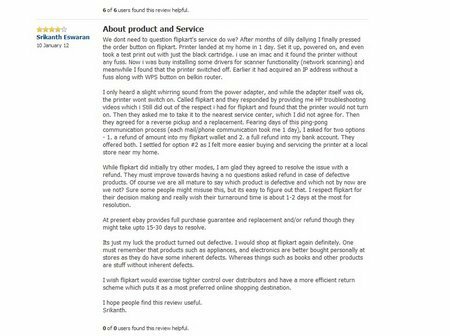 It is highly desired a company like Flipkart work on their shortcomings and appreciate such reviews and bring about improvements. Definitely I assume that no one will stop ordering this printer based on my above review. You can read it for yourself if you have a doubt. The moral of the story is simple. For products such as electronics, home appliances, etc, go to your nearest shop and purchase it. For things like books, software etc, order online !! Always weigh the pros and cons of what you are going to buy against ordering it in a shop vs ordering online. Keep in mind the huge turnaround time and the fact that not always will the redressal be to your benefit. Having said this, I just ordered a USB pen drive again from Flipkart and it got delivered in one day :) I wish flipkart works on no conditions asked refund atleast for defective products which will take it a long way in making it a preferred online shopping portal over other similar ones! This is where the Paisa Pay protection model of eBay comes to my mind where all your purhcases are fully covered against defects. The math of owning cars - diesel or petrol ?